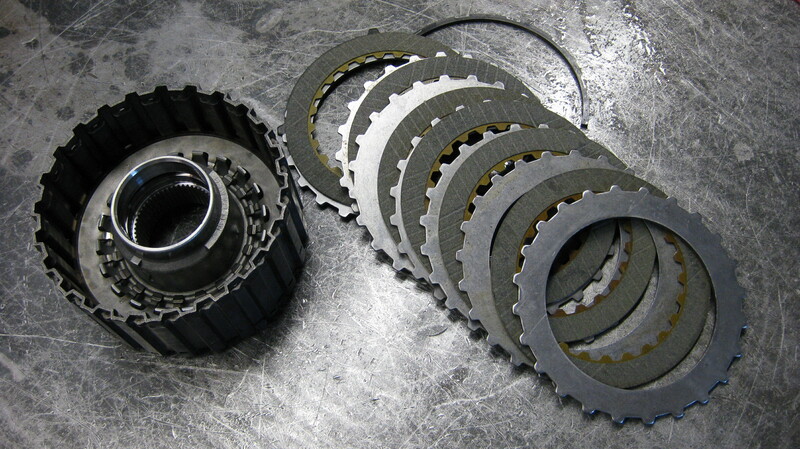 In this picture is our updated K-3 clutch pack for a Porsche Tiptronic 722.6 automatic. This set up helps 4th gear to handle more torque. This pack gets an extra friction disk and an extra steel reaction plate, again we’re utilizing Green High Energy friction material. This material is somewhat erroneously called “Kevlar” lining. Keep in mind that although the Porsche 722.6 is very different in many ways, it shares plenty of its internal parts with The Chrysler/Mercedes 722.6, NAG 1, w5A580, etc.